Comics are infamous for their sometimes convoluted plots: perhaps none more so than DC’s “Hawk” Heroes. 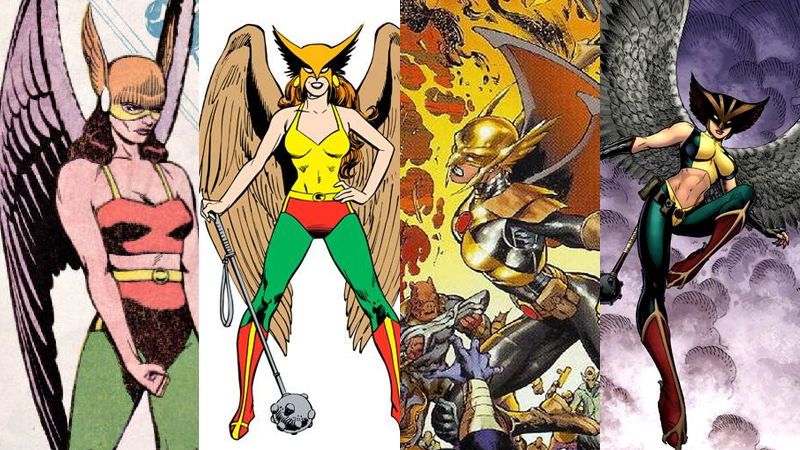 We’ve already covered the fluctuating origins of Hawkman, but with his superhero partner Hawkgirl making her TV debut in Legends of Tomorrow, it’s time to delve into the maniacally convoluted history of Hawkgirl. When she was first introduced by writer Gardner Fox and artist Dennis Neville, and as she would be for much of her history, Hawkgirl was intimately linked with Hawkman. Shortly after Carter Hall discovered he was the latest reincarnation of an Egyptian prince named Khufu, he met a woman named Shiera Sanders—who Carter discovered was the reincarnation of Khufu’s lover, Chay-ara (who was, apparently, originally named Shiera). Carter became Hawkman and romantically involved himself with Shiera in his first appearance in 1940, but it would take just over a year and a half for Shiera to become Hawkgirl—in her case, literally borrowing a spare set of Carter’s armor and pretending to be Hawkman, before joining Carter on his adventures and adopting the Hawkgirl name. Although they were part of DC’s superhero boom in the 1940s, Hawkman and Hawkgirl weren’t really superheroes themselves, even beyond their mythological origins. Their powers were gained by wearing special wings made out of a mysterious element called “Ninth Metal.” The Ninth Metal granted them the power of flight when worn, as well as enhanced strength, but also played a key part in Shiera’s origin: Khufu and Chay-ara were murdered by a Ninth Metal knife, dooming them to be forever reincarnated over thousands of years, and hunted down by reincarnations of their murderer: a maniacal Egyptian priest named Hath-Set. Carter and Shiera’s Golden Age adventures didn’t last for long: they never had their own series, and wer always a back story in the pages of The Flash and All-Star Comics. So when the series ended in 1949 as superhero comics declined in popularity, Hawkgirl and Hawkman ceased to be as well. When DC decided to revamp their superhero output in the mid-1950s, they took the opportunity to revamp the vast majority of their former characters, giving them new origins, new looks, and in some cases, new identities. There was also more of an element of science-fiction introduced by DC’s writers—the more magical and fantastical origins of the original characters being deemed as out of touch. Shiera was one of the heroes most strongly affected by this, and like Carter, was given a completely new reimagining for the Silver Age. As was the case in the ‘40s, Katar and Shayera began as back up characters in other series, like World’s Finest Comics, and eventually the reboot of All-Star Comics in the mid-’70s—but the duo then had their own ongoing series during the ‘60s, titled Hawkman. It was a tough time for Shayera; she was sidelined when Hawkman was chosen to join the Justice League in 1964, so while Katar began featuring in a wider line of comics alongside the League, Shayera was largely restricted to the Hawkman stories being told in World’s Finest and Hawkman. It would take another thirteen years before Hawkgirl joined the Justice League. But it wasn’t all bad news for Shayera—in 1981, she ditched the Hawkgirl name and declared herself Hawkwoman. Despite their League status, Hawkman and Hawkgirl stayed on as relatively minor characters in DC’s pantheon, content to exist in side-stories and crossovers rather than in their own series. That minor nature is perhaps why they unexpectedly ended up becoming one of the biggest messes in DC Canon when Crisis on Infinite Earths happened, especially Shayera. Except for Shayera, Katar, Carter and Shiera. Not only did they remain as they had been before Crisis, they now existed alongside each other on the same Earth. Although Carter and Shiera were pushed aside alongside the rest of their fellow surviving Justice Society members from the Golden Age, trapped fighting an endless battle in a dimension named Limbo. But the problem of Shayera and Katar remained. Four years after Crisis, before Hawkman and Hawkwoman got their own reboot miniseries... which only made matters worse. Hawkworld, released in 1989, was initially meant to wipe the slate clean for Shayera and Katar and reboot their Silver Age origins. They were no longer husband and wife (Shayera was now Thal, rather than Hol), but she was still his Thanagarian Police partner. Shayera was also no longer Hawkgirl in any form, but Hawkwoman from the beginning. The miniseries was a big success for DC, almost out of nowhere, and the company decided to retool it into a full- fledged ongoing comic the following year, giving Hawkman and Hawkwoman their own series for the first time since in nearly 30 years. However, DC made a horrendous mistake: Hawkworld retconned Shayera and Katar as arriving on Earth in the early ‘90s, despite their presence in storylines between Crisis and Hawkworld in the late 1980s. In a rush to patch up the gaping holes in continuity, DC made a hasty series of retcons to both characters, but Shayera in particular got the rough end of the bargain. Her Silver Age incarnation, Shayera Hol, was wiped from continuity completely and instead of appearing in Post-Crisis stories, she was replaced by a short-lived alternate Hawkwoman, a human named Sharon Parker tricked by a Thanagarian sleeper agent and later murdered for discovering the deception. All this allowed the new Shayera to live on as Hawkwoman, but matters were made even more confusing during the 1994 event Zero Hour, a spiritual follow-up to Crisis on Infinite Earths which partially had the aim of retooling the mistakes made in Hawkman’s origins after the event. It did so by returning the original Carter and Shiera from Limbo and then merging them into Katar’s spirit, creating a new, unhinged Hawkman personality in his body. Shayera was dismayed at the loss of her now-husband, and eventually gave up the Hawkwoman mantle, retiring from superheroics to become a Chicago Police Officer. In 1999, five years after the events of Zero Hour, DC decided to resurrect Hawkgirl as a character as part of their reboot of the Justice Society of America comic, now entirely separate from Shayera Thal’s Hawkwoman. The new Hawkgirl, Kendra Saunders, was the grandniece of Carter and Shiera Hall, and had a completely new origin—after committing suicide, Kendra’s body was resurrected by the spirit of Shiera Hall entering it, who had somehow remained tangible after her merging into Katar Hol in Zero Hour. Unlike Shiera before her, Kendra had no memories of the spirit’s past lives, fully believing herself to still be Kendra Saunders, and was trained to become the new Hawkgirl by her grandfather, using the gear left behind by Shiera. Kendra played a major role in the JSA comic, and eventually transferred to appear in the then-new Hawkman ongoing (who was now once again a resurrected version of the original Carter Hall). In fact, Kendra’s popularity—perhaps spurred by the Hawkgirl character’s (who was a completely different character altogether) major role in the then-contemporary Justice League and Justice League Unlimited animated series—saw her supplant Carter in 2006, renaming the Hawkman series to Hawkgirl before it was canceled 16 issues later. Kendra’s Hawkgirl was relegated to a guest character for the Justice League following Hawkgirl’s cancelation, and was eventually transformed into her own self again, with Shiera Hall’s spirit leaving her body. Kendra even developed romantic feelings for Carter Hall, but before she could act upon them, she and Carter were murdered and turned into resurrected evil “Black Lanterns” as part of the Blackest Night event series in 2009. Many former heroes from the DC universe were resurrected in the event, and at its conclusion, were even restored to their normal selves—Hawkman and Hawkgirl were re-resurrected, but there was a twist: Kendra Saunders did not return from the grave, but instead Shiera Hall in her place, who remembered her past lives with Carter. The reunion between Shiera and Carter wouldn’t last though, and in a follow -p event called Brightest Day, Shiera sacrificed herself to defeat the villainous “Dark Avatar.” Hawkgirl, in any form, was no more. Following the 2011 “New 52” reboot, Hawkgirl and Hawkwoman both made appearances again. Hawkwoman, once again Shayera Thal, made a brief appearance in the new Hawkman series as a Thanagarian Princess who sacrificed to save the life of the new Hawkman, Katar Hol. Meanwhile, Kendra was completely rebooted not as a part of the new Earth-One, but a hero of Earth-2, leaving no Hawkgirl in DC’s new main continuity. Kendra Munoz-Saunders had no former connections to the past any Hawkgirl (or Hawkwoman), a treasure hunter who was granted magical wings after exploring an ancient tomb, and eventually joined the parallel Earth’s Justice Society—which, even after a semi-reboot of the DC Multiverse earlier this year during the Convergence event, she remains a part of to this day.